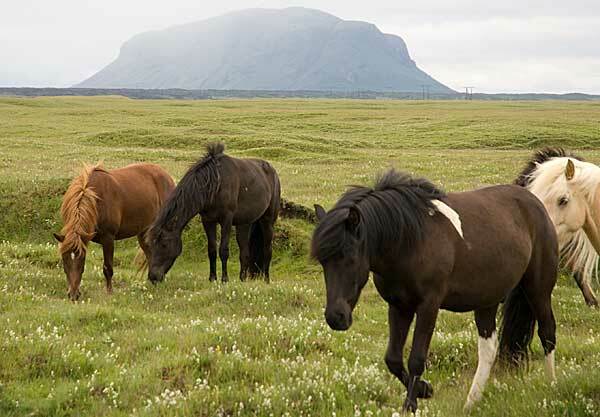 Plasma insulin concentrations in Icelandic horses tend to increase with body condition score, Scandinavian researchers report. Plasma insulin levels also rose in line with the amount of concentrated feed given to the animals. Researchers Anna Jansson, Gudrun Stéfansdóttir and Sveinn Ragnarsson set out to investigate the variation in plasma insulin concentration in a group of Icelandic horses in training. They focused in particular on relationships between plasma insulin levels and gender, age, body size, body condition score and management factors such as feed allowance and subjective level of fitness. All 201 horses enrolled in the study were considered to be healthy. The horses were each weighed, had their body condition score assessed, and their wither height taken from the database registry. Each owner or rider answered a questionnaire about their horse, including a subjective assessment of its fitness. Each horse had a blood sample taken for insulin testing before they were to undergo a breed evaluation field test which was unrelated to the study. Body condition score in the horses ranged from 2.3 to 4.0 on the 5-point scale devised for Icelandic horses, which corresponds to about 4–7 on the conventional 9-point scale. The amount of concentrated feed each animal received daily ranged from none up to 4 kilograms. The study team, writing in the journal Acta Veterinaria Scandinavica, found a significant link between concentrate allowances given to the horses and plasma insulin levels. For every 1kg increase in the concentrate allowance, plasma insulin levels increased by an average of 0.26 mU/l. For every 1 unit increase in body condition score, insulin levels increased by 0.45 mU/l. However, there was no correlation between body condition score and concentrate allowance. Similarly, there was no effect of hay allowance, level of fitness, transport time, body size or age on plasma insulin concentration. There was a tendency for stallions to have higher insulin concentrations than mares, they reported. “Owners of Icelandic horses should be aware that increased body condition elevates plasma insulin concentration, and thereby potentially the risk of laminitis,” the trio reported. The horses in the study were considered by their owners to be fit for their breed evaluation field test. The authors noted that the pre-test insulin concentration increased not only due to levels of concentrate intake, as could be expected, but also to a considerable extent due to an increase in body condition score. Icelandic horses are recognised as easy keepers. The study team said high plasma insulin concentrations and laminitis have been associated with the easy keeper type of horse. They said they undertook the research because variations in insulin levels in Icelandic horses and the factors that influenced it were limited. Anna Jansson is with the Swedish University of Agricultural Sciences; Gudrun Stéfansdóttir and Sveinn Ragnarsson with Iceland’s Holar University College. The full study, published under Creative Commons License, can be read here.